Greyhound will be merging mid-day and night schedules because of low ridership, which will result in less frequent bus trips between the two cities. 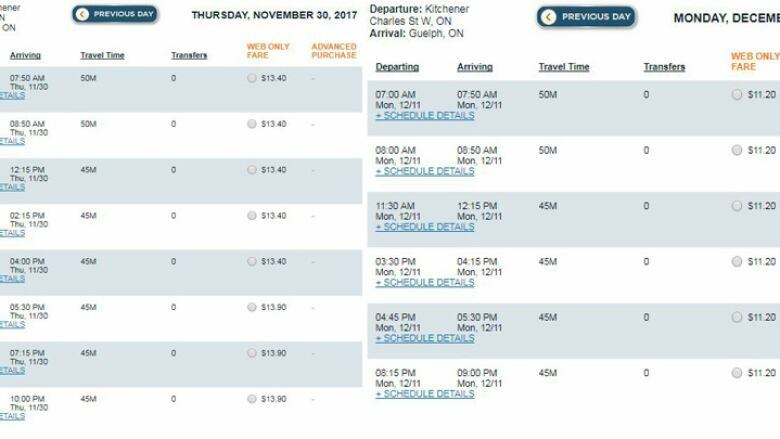 People planning to use Greyhound buses after Dec.10 should keep an eye on schedule changes, as the carrier will be doing some service adjustments between Kitchener and Guelph. Greyhound will be merging mid-day and night schedules because of low ridership, it says, which will result in less frequent bus trips between the two cities. "We've gone from about 301 stops that combine stops between Toronto, Guelph, Kitchener and Cambridge a week, it's going down to about 257," David Butler, regional vice president for eastern Greyhound Canada, told CBC News. Butler said that competition with GO Transit has led to low ridership. "We do compete with GO Transit on the same corridors, they've got lots of frequency in the same areas, it's a subsidized service and that's difficult for us to compete with, they're exempt form charging HST, which we are not, which makes it even more competitive for us," he said. Butler said they have identified that mid-day and late at night bus schedules have the lowest ridership, adding that making schedule changes during those times will have the least impact to ridership. "Regrettably when you make these kinds of decisions you will impact someone," he said. "We're just trying to have the least amount of impact to the ridership as possible by looking at the schedule performance over the last year. We are not impacting schedules that are good performers." Greyhound staff will be speaking with the public during Greyhound's annual commuter meeting, where they will review schedule merges and changes. There will be a commuter meeting in Kitchener on Wednesday at the Crowne Plaza Hotel at 7 p.m.
Greyhound wants to eliminate more bus routes in B.C.